The Single Late Division now officially includes the Darwin tulips (a group distinct from the Darwin Hybrids) and most of the Breeder tulips, but the Darwin tulips and the Breeders are treated separately here as well as by Hortus Bulborum. The Single Late Division now also includes many former Cottage Tulips. Cottage Tulips are not treated as a separate category on this website. 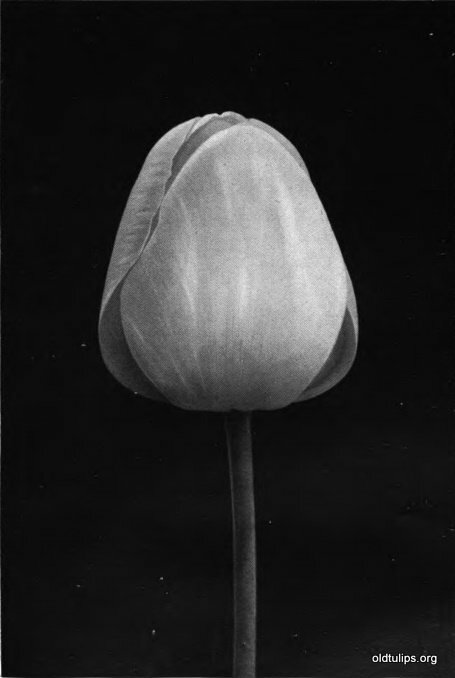 However, the former scope and importance of the Cottage Tulip class is illustrated by the Report of the Tulip Nomenclature Committee, 1914-15, which made Cottage Tulips their Class 4. See: Cottage Tulips. The following descriptions and images are from this source. Note that the descriptions frequently include references to "Types", which are defined and illustrated below. The designation "(HB)" following a tulip name indicates this cultivar is in the collection of Hortus Bublorum, which is the current authority on these tulips. type 2.�Pointed, e.g. 'Mrs. Moon' Fig. 2.
type 3.�Egg-shaped, e.g. 'John Ruskin' Fig. 3.
type 4.�Segments reflexed, e.g. 'Retroflexa' Fig. 4. Admiral Tromp, <1932 (HB) See under Breeder Tulips. Aesculapius, <1863 (HB) (RL) See under Breeder Tulips. Albert Tear, 1960 (Byb) (WNE) [erroneously listed as 'Albert Tears' in some sources] (HB) (RL) ) See under Breeder Tulips. Albury, 1959 "Flower currant red, lightly tinged dull gray; 20 inches (50 cm)" -- TG. Image Index: Tulip Gallery. Alcida, <1916 (HB) (RL) See under Breeder Tulips. Alcmene, 1917 (HB) "Flower red." -- TG. Image Index: Tulip Gallery. Alice. See: Prince Albert under Breeder Tulips. Alice Keith, 1930 (HB) (RL) See under Breeder Tulips. Anne Frank, 1960 "Flower white; 22 inches (55 cm)" -- TG. Image Index: Tulip Gallery. Annie McGregor, @ 1860 (Rose) (WNE) See under Breeder Tulips. Apricot, <1916 (HB) (RL) See under Breeder Tulips. Arcadia, (RL) ) See under Breeder Tulips. Archeron, <1913 (HB) (RL) See under Breeder Tulips. Arentine Arendsen. See: May Queen under Darwin Tulips. Arethusa, <1916 (HB) "Flower yellow." -- TG. Image Index: Tulip Gallery. Argo, <1916 (HB) "Flower orange." -- TG. Image Index: Tulip Gallery. Argyre, (RL) See under Breeder Tulips. Asta Nielsen, 1950 (HB) "Flower yellow; 28 inches (70 cm)" -- TG. Image Index: Tulip Gallery. Avis Kennicott, 1900 (HB) "Cottage Tulip. Flower yellow. Type 2: pointed, e.g. 'Mrs. Moon' (Fig. 2). Form and substance good; bright pale yellow, with black streaks at base, filaments black; 22 inches; May 8, 19 days." -- Report, 1914-15 / Cottage Tulips. Bacchus, <1913 (HB) (RL) See under Breeder Tulips. Balalaika, 1952 "Flower turkey red; 28 inches (70 cm)" -- TG. Image Index: Tulip Gallery. Bessie, late 19th century (Byb) (WNE) 1847 (HB) (RL) See under Breeder Tulips. Bingham, 1950 (HB) "Flower yellow; 24 inches (60 cm)" -- TG. Image Index: Tulip Gallery. Bird of Paradise. See: Mrs. Keightley. Biscuit. See: Bronze Queen under Breeder Tulips. Blue Star, <1914 (syn. : Gesneriana rosea.) (HB) "Cottage Tulip. Flower cerise. Type 2: pointed, e.g. 'Mrs. Moon' (Fig. 2). A form of 'Gesneriana'; base with the fine blue-blotched base of 'Gesneriana spathulata' (Fig. 5); 24 inches; May 10, 18 days." -- Report, 1914-15 / Cottage Tulips. Boadicea, <1915 (HB) "Cottage Tulip. Flower orange-scarlet. Type 2-3 (see above). Rather short, a smaller, rather more pointed flower than 'Hammer Hales'; base as in Fig. 8, yellow, with a broad olive margin; 29 inches; May 8, 18 days." -- Report, 1914-15 / Cottage Tulips. Image Index: Tulip Gallery. Bonfire. See: Lucifer under Breeder Tulips. Bouton d�Or, <1897 (syn. : Golden Beauty; Ida.) (HB) "Cottage Tulip. Flower yellow. Type 1: cup-shaped, e.g., Bouton d;Or (Fig. 1).. Of medium size and very fine form and sub- stance; filaments blackish at apex; 25 inches; May 7, 21 days. (Fig. 1.)" -- Report, 1914-15 / Cottage Tulips. Bronze Beauty, <1944 (HB) "Flower purple rose, orange." -- TG. Image Index: Tulip Gallery. Bronze King, <1911 (HB) (Grandissima) (RL) See under Breeder Tulips. Bronze Queen, <1911 (HB) (Biscuit, Clio, Duc de Orleans, Sensation) (RL) See under Breeder Tulips. Caledonia, <1904 (HB) "Cottage Tulip. Flower orange-scarlet. Type 1: cup-shaped, e.g., Bouton d;Or (Fig. 1).. Form and substance good; base as Fig. 9, yellow, blotched olive; filaments olive above the middle; 22 inches; May 10, 16 days." -- Report, 1914-15 / Cottage Tulips. Image Index: Tulip Gallery. Candidate, ?? (HB) See under Breeder Tulips. Candolle, 1926 "Flower salmon orange." -- TG. Image Index: Tulip Gallery. Cape Town, 1954 (HB) (RL) See under Breeder Tulips. Cardinal Manning, <1913 (HB) (RL) See under Breeder Tulips. Carmargue, ?? "Flower cream red." -- TG. Image Index: Tulip Gallery. Carrara, 1912 "Flower white; 22 inches (55 cm)" -- TG. Image Index: Tulip Gallery. Casius, (RL) See under Breeder Tulips. C. G. van Tubergen�s Glory, 1931 (HB) See: Tuberman's Glory under Darwin Tulips. Cherbourg, 1915 (HB) (RL) See under Breeder Tulips. Claudette, 1952 "Flower white, red; 24 inches (60 cm)" -- TG. Image Index: Tulip Gallery. Clio. See: Bronze Queen under Breeder Tulips. Color Beauty. See: Princess Margaret Rose. Columbine, 1920 (Byb) (WNE) <1929 (HB) (RL) See under Breeder Tulips. Copernicus, <1916 (HB) (RL) See under Breeder Tulips. Corinna, <1929 (HB) (RL) See under Breeder Tulips. Cyrano, (RL) See under Breeder Tulips. Decorator, 1957 "Flower red; 20 inches (50 cm)" -- TG. Image Index: Tulip Gallery. Deryn Roberts, 1990 (Biz) (WNE) See under Breeder Tulips. Dido, 1914 (HB) "Flower pink; 24 inches (60 cm)" -- TG. Image Index: Tulip Gallery. Dillenburg, 1916 (HB) (RL) See under Breeder Tulips. Dolores. See: La Tristesse under Darwin Tulips. Dom Pedro, <1911 (HB) (RL) See under Breeder Tulips. Dorrie Overall, 1944 "Flower petunia violet; 24 inches (60 cm)" -- TG. Image Index: Tulip Gallery. Dreadnought. See: Velvet King under Breeder Tulips. Duc d'Orl�ans. See: Bronze Queen under Breeder Tulips. Duke of Westminster. See: Excelsior under Darwin Tulips. Dulcinea, 1917 (HB) "Flower deep rose; 24 inches (60 cm)" -- TG. Image Index: Tulip Gallery. Empress of China. See: Yellow Perfection under Breeder Tulips. Fairy Nymph, <1931 (HB) (RL) See under Breeder Tulips. Fairy Queen, ?? (HB) "Cottage Tulip. Flower shot. Type 2: pointed, e.g., Mrs. Moon (Fig. 2). Form and substance good; outside light purple, passing to a paler margin, tinged with primrose-yellow; inside deep yellow, with a purplish flush; base dull; filaments with a black ring at apex; 30 inches; May 15, 14 days." -- Report, 1914-15 / Cottage Tulips. Fantasma, 1952 " Flower red; 24 inches (60 cm)" -- TG. Image Index: Tulip Gallery. Feu Ardent, 1907 (HB) (RL) See under Breeder Tulips. Fulgens maxima lutea. See: Mrs. Moon. Fulton, 1951 (RL) See under Breeder Tulips. Gander, 1952 "Flower bright magenta; 24 inches (60 cm)" -- TG. Image Index: Tulip Gallery. Geisha, <1923 (HB) "Flower light lilac pink; 26 inches (65 cm)" -- TG. Image Index: Tulip Gallery. General Ney, <1837 (HB) (RL) See under Breeder Tulips. George Grappe, <1932 (HB) (RL) See under Breeder Tulips. Georgette, 1952 "Flower yellow, red." -- TG. Image Index: Tulip Gallery. gesneriana albo-marginata. See: Sweet Nancy. gesneriana aurantiaca. See: Globe of Fire. gesneriana L.Lutea, <1901 (HB) "Cottage Tulip. Flower yellow. Type 2: pointed, e.g.,' Mrs. Moon' (Fig. 2). Large, opening well, clear deep colour; 20 inches; May 8, 19 days." -- Report, 1914-15 / Cottage Tulips. gesneriana lutea pallid. See: Mrs. Keightley. gesneriana Rosea, 1901 (HB) Note: "Report, 1914-15: makes this a cross-reference to 'Blue Star'. gesneriana L. Spathulata, <1904 (HB) "Cottage Tulip. Flower cochineal-red. Type 2: pointed, e.g., 'Mrs. Moon' (Fig. 2). Large, of good substance, opening well; colour bright and clear; base as Fig. 5, clear bright blue; 28 inches; May 8, 18 days. A strong and brilliant garden flower. (Fig. 5.)" -- Report, 1914-15 / Cottage Tulips. Glare of the Garden, 1904 (syn. : Maculata globosa grandiflora.) (HB) "Cottage Tulip. Flower cochineal-red. Type 2-3 (see above). A form of 'Maculata'. Large, form and substance good, colour deep; base of the form in Fig. 9, black and yellow; filaments black; 20 inches; May 6, 19 days." -- Report, 1914-15 / Cottage Tulips. Image Index: Tulip Gallery. Gleam, c 1930 (Biz) (WNE) See under Breeder Tulips. Globe of Fire, <1914 (syn. : Gesneriana aurantiaca.) (HB) "Cottage Tulip. Flower orange-scarlet. Type 2: pointed, e.g., Mrs. Moon (Fig. 2). A form of 'Gesneriana.' Large, form and substance good; base large, pale olive-black; filaments olive- brown; 30 inches; May 12, 14 days." -- Report, 1914-15 / Cottage Tulips. Gloria, ?? (Rose) (WNE) (HB) (RL) See under Breeder Tulips. Gloria Mundi, ?? "Flower pink; 24 inches 60 cm)" -- TG. Image Index: Tulip Gallery. Godet Parfait, <1912 (HB) (RL) See under Breeder Tulips. Golden Beauty. See: Bouton d'Or. Golden Crown, <1901 (syn. : Yellow Crown.) (HB) "Cottage Tulip. Flower yellow, edged red. Type 2: pointed, e.g., 'Mrs. Moon' (Fig. 2). Large, form and substance fair; 20 inches; May 6, 20 days." -- Report, 1914-15 / Cottage Tulips. Golden Tears. See: Gold Tears under Breeder Tulips. Goldfinder, late 19th century (Biz) (WNE) See under Breeder Tulips. Gold Tears (syn. : Golden Tears) See under Breeder Tulips. Good Gracious, <1942 (HB) "Flower orange, flushed yellow; 24 inches (60 cm)" -- TG. Image Index: Tulip Gallery. Gorgeous. See: Lucifer under Breeder Tulips. Grandissima. See: Bronze King. See under Breeder Tulips. Great Simon, (RL) See under Breeder Tulips. Grenadier, 1912 (HB) "Cottage Tulip. Flower orange-scarlet. Type 3: egg-shaped, e.g. 'John Ruskin' (Fig. 3). Large, form and substance good; colour very bright; base as in Fig. 7, yellow; 21 inches; May 8, 17 days." -- Report, 1914-15 / Cottage Tulips. Gretchen, 1904 (syn. : Margaret) (HB) See under Darwin Tulips. See also Gretchen under Broken tulips. Hubert Calvert, 1980 (Rose) (WNE) (RL) See under Breeder Tulips. Inglescombe Pink, <1908 (syn. : Parisian Aurore; Salmon Queen.) "Cottage Tulip. Flower pink. Type 1: cup-shaped, e.g., Bouton d;Or (Fig. 1).. Large form and substance good; colour good, much deeper outside; base as in Fig. 5, pale blue; 25 inches; May 8, 17 days." -- Report, 1914-15 / Cottage Tulips. Image Index: Tulip Gallery. Inglescombe Scarlet, 1902 (HB) "Cottage Tulip. Flower scarlet. Type 2: pointed, e.g., 'Mrs. Moon' (Fig. 2). Form and substance good; base as in Fig. 11, black, with yellow points; 26 inches; May 8, 18 days." -- Report, 1914-15 / Cottage Tulips. Image Index: Tulip Gallery. Inglescombe Yellow, 1906 (HB) "Cottage Tulip. Flower yellow. Type 1: cup-shaped, e.g., 'Bouton d;Or' (Fig. 1).. Long, form and substance very good; base bluish; 23 inches; May 13, 17 days." -- Report, 1914-15 / Cottage Tulips. Ivory Glory, 1944 (HB) "Flower amber white; 24 inches (60 cm)" -- TG. Image Index: Tulip Gallery. Ixioides, 1901 (syn. : Gesneriana ixioides.) "Cottage Tulip. Flower yellow. Type 2-3 (see above). Form good, opens well; base as Fig. 11, black; filaments black; 26 inches; May 10, 17 days." -- Report, 1914-15 / Cottage Tulips. James Akers. See: Akers under Breeder Tulips. James Wild, 1860 (Biz) (WNE) (HB) (RL) See under Breeder Tulips. Jane L. Eyre, 1970 (Byb) (WNE) See under Breeder Tulips. Jaune d�Oeuf, <1863 (syn. : Sunrise) (HB (RL) See under Breeder Tulips. Jaune Pure. See: Parisian Yellow. Jeanne Desor, <1921 (HB) "Flower orange yellow, edged red; 24 inches (60 cm)" -- TG. Image Index: Tulip Gallery. Je Maintiendrai, <1863 (syn. : Sentinel) (HB) (RL) See under Breeder Tulips. Jessie, ?? (Rose) (WNE) See under Breeder Tulips. Joan Cruickshank, 1955 (HB) "Flower carmine rose; 24 inches (60 cm)" -- TG. Image Index: Tulip Gallery. John Ruskin, 1904 (HB) "Cottage Tulip. Flower shot. Type 3: egg-shaped, e.g. 'John Ruskin' (Fig. 3). Form and substance fair; pink and orange; base yellowish, with olive ring; 24 inches; May 10, 15 days." -- Report, 1914-15 / Cottage Tulips. Joseph Israels. See: The Sultan under Darwin Tulips. Jo Vincent, 1931 "Flower camellia rose; 22 inches (55 cms)" -- TG. Image Index: Tulip Gallery. Jules Favres, <1913 (HB) (RL) See under Breeder Tulips. Julia Farnese, 1853 (Rose) (WNE) See under Breeder Tulips. Juliette (Juliet), 1845 (Rose) (WNE) (HB) 1840 (RL) See under Breeder Tulips. Jupiter, <1913 (HB) (RL) See under Breeder Tulips. Kaj Munk, 1954 (HB) "Flower carmine rose; 28 inches (70 cm)" -- TG. Image Index: Tulip Gallery. Kathleen Fruxton, <1942 (HB) (RL) See under Breeder Tulips. King Salomon, 1953 (HB) 'Flower mahogany red, edged cream; 24 inches (60 cm)" -- TG. Image Index: Tulip Gallery. Kleurenpracht. See: Princess Margaret Rose. Klopstock, <1863 (HB) (RL) See under Breeder Tulips. La Candeur. See: White Queen under Darwin Tulips. La Douceur,<1863 (HB) (RL) See under Breeder Tulips. 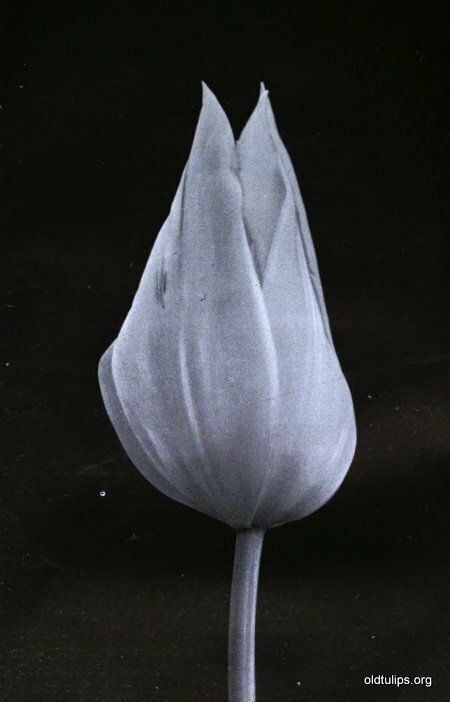 La Harpe, <1863 (HB) See under Breeder Tulips. La Joyeuse, <1863 (HB) (RL) See under Breeder Tulips. Le Mogol, <1913 (HB) (RL) See under Breeder Tulips. Lemon Queen. See: Mother's Day. Lina Schneider. See: Phyllis under Darwin Tulips. Lisette, 1954 (HB) " Flower pink; 22 inches (55 cm)" -- TG. Image Index: Tulip Gallery. Lord Stanley, 1880 (HB) (RL) See under Breeder Tulips. Louis XIV, <1913 (HB) (RL) See under Darwin Tulips. Lucifer, 1907 (syn. : Bonfire, Gorgeous) (HB) (RL) See under Breeder Tulips. Mabel, 1850 (HB) (RL) See under Breeder Tulips. Maculata Globosa grandiflora. See: Glare of the Garden. Madras, <1913 (HB) (RL) See under Breeder Tulips. Magier, 1951 (syn. : Magician.) "Flowe white, edged violet blue; 24 inches (60 cm)" -- TG. Image Index: Tulip Gallery. Mahogany, 1905 (HB) (RL) See: King Harold under Darwin Tulips. Note: 'Mahogany' is the preferred name of Hortus Bulborum, but it is listed under 'Mahogany' by "Report, 1914-15". Mariandel, 1950 "Flower orchid purple, edged white; 20 inches (50 cm)" -- TG. Image Index: Tulip Gallery. Marie. See: Valentine under Darwin Tulips. Marie Louise, <1901 (HB) (RL) See under Breeder Tulips. 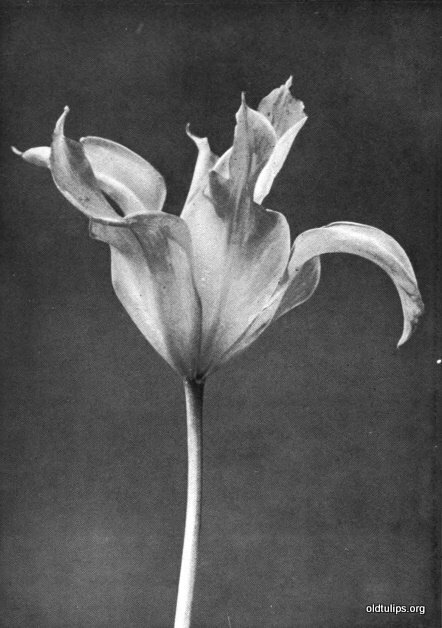 Marjorie Bowen, 1921 (HB) Flower salmon; 24 inches (60 cm) Image Index: Tulip Gallery. Marquis, <1929 (HB) "Flower light violet; 24 inches (60 cm)" -- TG. Image Index: Tulip Gallery. Marseillaise, 1957 (HB) "Flower cardinal red; 24 inches (60 cm)" -- TG. Image Index: Tulip Gallery. Marvel, 1912 (HB) "Flower amber; 24 inches (60 cm)" -- TG. Image Index: Tulip Gallery. Maryland, 1930 (HB) (RL) See under Breeder Tulips. Matchless. See: Roi d�Islande under Darwin Tulips. Mayflower, <1922 (HB) 1922 "Flower light scarlet; 22 inches (55 cm)" -- TG. Image Index: Tulip Gallery. Medea, <1912 (HB) (RL) See under Breeder Tulips. Melva, <1931 (HB) (RL) See under Breeder Tulips. Mirella, 1953 (HB) "Flower deep salmon, edged pale salmon; 24 inches (60 cm)" -- TG. Image Index: Tulip Gallery. Moonlight, <1904 (HB) "Cottage Tulip. Flower primrose. Type 2-3 (see above). Large, form and substance good, colour very soft; 21 inches; May 6, 19 days." -- Report, 1914-15 / Cottage Tulips. Moroccan Beauty, 1955 (HB) (RL) See under Breeder Tulips. Mother�s Day, 1931 (syn. : Lemon Queen.) (HB) "Flower yellow; 22 inches (55 cm)" -- TG. Image Index: Tulip Gallery. Mount Erebus. See: White City. Mr. D. T. Fish. See: Mrs. Potter Palmer under Darwin Tulips. Mrs. Clarke. See: Mrs. Moon. Mrs. Harold I Pratt, 1926 (HB) (RL) See under Breeder Tulips. Mrs. Hoog, 1921 (HB) "Flower pale yellow; 22 inches (55 cm)" -- TG. Image Index: Tulip Gallery. Mrs. John T. Scheepers, 1930 "Flower yellow; 24 inches (60 cm)" -- TG. Image Index: Tulip Gallery. Mrs Keightley, 1902 (syn. : Bird of Paradise; gesneriana lutea pallid.) (HB) "Cottage Tulip. Flower yellow. Type 2: pointed, e.g., 'Mrs. Moon' (Fig. 2). A form of 'Gesneriana'; ' paler than 'Gesneriana lutea,' but of larger size; base blotched with wax-yellow; 23 inches; May 3, 19 days." -- Report, 1914-15 / Cottage Tulips. Mrs. Moon, 1900 (syn. : Fulgens maxima lutea; Mrs. Clarke.) (HB) "Cottage Tulip. Flower yellow. Type 2: pointed, e.g., 'Mrs. Moon' (Fig. 2). Large, long, form and substance good; colour clear, with duller blotches at base; 30 inches; May 11, 19 days. (Fig. 2.)" -- Report, 1914-15 / Cottage Tulips. Music, <1939 (Byb) (WNE)_ (HB) (RL) See under Breeder Tulips. Narbonensis alba. See: Sweet Nancy. N.H. Eyre, 1970 (Byb) (WNE) See under Breeder Tulips. Norham Beauty, <1915 (HB) "Cottage Tulip. Flower shot. Type 2: pointed, e.g.,' Mrs. Moon' (Fig. 2). Form and substance fair; purplish, becoming yellowish at margin; base lemon-yellow, flushed olive; 24 inches; May 12, 16 days." -- Report, 1914-15 / Cottage Tulips. Image Index: Tulip Gallery. Northern Queen, <1930 (syn. : Queen of the North.) (HB) "Flower white, edged pink; 20 inches (50 cm)" -- TG. Image Index: Tulip Gallery. Old Times, <1919 (HB) (RL) See under Breeder Tulips. Orange Beauty, 1905 (HB) See under Breeder Tulips. Orange King, 1903 (HB) (RL) See under Breeder Tulips. Ossi Oswalda, <1932 (HB) "Flower creamy white, flushed rose; 22 inches (55 cm)" -- TG. Image Index: Tulip Gallery. Palistina, 1944 "Flower salmon pink, green; 16 inches (40 cm)" -- TG. Image Index: Tulip Gallery. Panorama, <1863 (HB) See under Breeder Tulips. Papago, 1940 (HB) See under Breeder Tulips. Parisian Aurore. See: Inglescombe Pink. Parisian Yellow, <1901 (syn. : Jaune Pure; Vanguard.) (HB) "Cottage Tulip. Flower yellow. Type 2: pointed, e.g., 'Mrs. Moon' (Fig. 2). A variety resembhng 'Gesneriana lutea'; base blackish; 33 inches; May 16, 14 days." -- Report, 1914-15 / Cottage Tulips. Image Index: Tulip Gallery. Pelgrim, 1943 "Flower violet; 22 inches (55 cm)" -- TG. Image Index: Tulip Gallery. Pink Pearl, ?? (HB) See under Breeder Tulips. Pourpre Magnifique, <1913 (HB) (RL) See under Breeder Tulips. President Hoover, 1930 (HB) See under Breeder Tulips. President Lincoln. See: Poupre Magnifique under Breeder Tulips. Pride of Inglescombe, <1914 (HB) "Cottage Tulip. Flower cream, flushed pink. Type 2: pointed, e.g., Mrs. 'Moon' (Fig. 2). Form and substance good; base small, blotched blue as in Fig. 5, and tinged yellow; 23 inches; May 11, 15 days." -- Report, 1914-15 / Cottage Tulips. Primrose Beauty, <1915 (HB) "Cottage Tulip. Flower primrose. Type 2: pointed, e.g., 'Mrs. Moon' (Fig. 2). Form and substance fair, somewhat constricted in the middle; 20 inches; May 12, 15 days." -- Report, 1914-15 / Cottage Tulips. Prince Albert, <1863 (HB) (RL) See under Breeder Tulips. Prince of Orange. See: Orange Beauty under Breeder Tulips. Prince of Wales, <1863 (HB) (RL) See under Breeder Tulips. Princess Margaret Rose, 1944 (syn. : Kleurenpracht; Color Beauty.) (HB) "Flower yellow, edged orange red; 24 inches (60 cm)" -- TG. Image Index: Tulip Gallery. Professor Schotel, <1870 (HB) See under Breeder Tulips. Queen Alexandra, <1900 (HB) See under Breeder Tulips. Queen Flora. See: Sieraad van Flora under Darwin Tulips. Queen of (the) Bartigons, 1944 (HB) See under Darwin Tulips. Queen of (the) Night, 1944 (HB) See under Darwin Tulips. Queen of the North. See: Northern Queen. Queen of Violets, <1948 (HB) See under Breeder Tulips. Red Indian, <1930 (HB) "Flower orange, shaded red; 22 inches (55 cm)" -- TG. Image Index: Tulip Gallery. Red Lion, 1951 "Flower red; 22 inches (55 cm)" -- TG. Image Index: Tulip Gallery. Renown, 1949 "Flower light carmine red; 26 inches (65 cm)" -- TG. Image Index: Tulip Gallery. Reve de Jeunesse. See: Dream under Darwin Tulips. Roi Soleil, <1919 (HB See under Breeder Tulips. Rose Copland, 1918 (syn. : William Copland Rose.) (HB) See under Darwin Tulips. Rose des Dames, <1863 (HB) (RL) See under Breeder Tulips. Rose Mist, 1942 (HB) "Flower white mottled rose pink; 22 inches (55 cm)" -- TG. Image Index: Tulip Gallery. Rosy Wonder, 1951 (HB) "Flower radiant pink, white base; 24 inches (60 cm)" -- TG. Image Index: Tulip Gallery. Saginow (Saginaw), 1942 (HB) (Sagina) (RL) See under Breeder Tulips. Salmon Queen. See: Inglescombe Pink. Sam(uel) Barlow, 1860 (WNE) 1880 (HB) (RL) See under Breeder Tulips. Sanspareille, <1863 (HB) (RL) See under Breeder Tulips. Sara Akers, 1985 (Rose) (WNE) See under Breeder Tulips. Scarlet Glory, 1933 (HB) "Flower scarlet; 22 inches (55 cm)" -- TG. Image Index: Tulip Gallery. Sensation. See: Bronze Queen under Breeder Tulips. Show Girl (Showgirl), 1957 (HB) Flower creamy yellow, flamed carmine; 30 inches (75 cm) Image Index: Tulip Gallery. Sigrid Undset, 1954 (HB) "Flower creamy white; 24 inches (60 cm)" -- TG. Image Index: Tulip Gallery. Silver Crown, <1850 (syn. : Albiftora.) (HB) "Cottage Tulip. Flower white. Type 2: pointed, e.g., 'Mrs. Moon' (Fig. 2). Opening wide; 18 inches; May 6, 15 days." -- Report, 1914-15 / Cottage Tulips. Image Index: Tulip Gallery. Silver Wedding, 1950 "Flower yellow, edged white; 26 inches (65 cm)" -- TG. Image Index: Tulip Gallery. Simon Bolivar, 1944 (HB) See under Breeder Tulips. Sir Edward Grey. See: Nauticus under Darwin Tulips. Smetana, 1955 "Flower bronzy yellow; 32 inches (80 cm)" -- TG. Image Index: Tulip Gallery. Smiling Ann, 1933 "Flower white, edged pink; 20 inches (50 cm)" -- TG. Image Index: Tulip Gallery. Smiling Princess, 1953 (HB) "Flower rose, edged pale rose; 22 inches (55 cm)" -- TG. Image Index: Tulip Gallery. Smiling Queen, 1938 (HB) "Flower rose, edged silver pink; 24 inches (60 cm)" -- TG. Image Index: Tulip Gallery. Sulphur, 1860 (Biz) (WNE) See under Breeder Tulips. Sunrise. See: Jaune d�Oeuf under Breeder Tulips. Sunset, <1914 (syn. : Billietiana Sunset.) (HB) "Cottage Tulip. Flower yellow. Type 2: pointed, e.g., 'Mrs. Moon' (Fig. 2). Large, and of good substance; colour bright; 21 inches; May 8, 19 days." -- Report, 1914-15 / Cottage Tulips. Superba, 1913 (HB) See under Breeder Tulips. Sweetheart. See: Princess Juliana under Darwin Tulips. Sweet Lavender. See: William Copland under Darwin Tulips. Sweet Nancy, <1914 (syn. : gesneriana alba-marginata; Narbonensis alba.) (HB) "Cottage Tulip. Flower white, edged pink. Type 2: pointed, e.g., 'Mrs. Moon' (Fig. 2). Segments reflexed at tips when old; base and filaments bluish; 21 inches; May 7, 16 days." -- Report, 1914-15 / Cottage Tulips. Image Index: Tulip Gallery. Talisman, 1860 (Byb) (WNE) <1860 (HB) (RL) See under Breeder Tulips. Tantalus, 1926 (HB) See under Breeder Tulips. Television, 1958 "Flower fiery red, edged orange red; 26 inches (65 cm)" -- TG. Image Index: Tulip Gallery. Temple of Beauty, 1959 "Flower salmon rose; 30 inches (75 cm)" -- TG. Image Index: Tulip Gallery. The Bride. See: La Fiancee under Darwin Tulips. 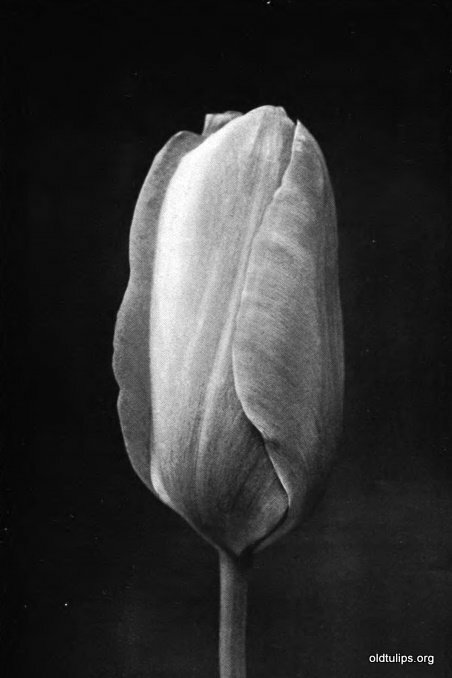 The Fawn, <1901 (HB) "Cottage Tulip. Flower shot. Type 2: pointed, e.g., 'Mrs. Moon' (Fig. 2). Form and substance fair; white, suffused rose, outside with a beam of salmon; base blotched with yellow; filaments yellow, with an olive ring at apex; 27 inches; May 15, 14 days." -- Report, 1914-15 / Cottage Tulips. Image Index: Tulip Gallery. Themis, <1900 (HB) "Flower white, 20 inches (50 cm)" -- TG. Image Index: Tulip Gallery. Titanic, 1939 (HB) See under Breeder Tulips. Tubergen�s Glory, 1931 (syn. : C. G. van Tuberman's Glory.) (HB) See under Darwin Tulips. Velvet King, 1912 (syn. : Velvet Gem; Dreadnought) (HB) (RL) See under Breeder Tulips. Violet Queen, 1931 "Flower violet blue; 22 inches (55 cm)" -- TG. Image Index: Tulip Gallery. Vitellina, 1896 (HB) "Cottage Tulip. Flower primrose. Type 2: pointed, e.g., M'rs. Moon' (Fig. 2). Long, form and substance good; 31 inches; May 16, 12 days." -- Report, 1914-15 / Cottage Tulips. Vlammenspel, 1941 (syn. : Fireside.) "Flower yellow, flamed blood red; 20 inches (50 cm)" -- TG. Image Index: Tulip Gallery. Vulcan, <1913 (HB) (RL) See under Breeder Tulips. Wallflower, 1943 "Flower purple brown; 20 inches (50 cm)" -- TG. Image Index: Tulip Gallery. Wendy Akers, (RL) See under Breeder Tulips. White City, 1932 (syn. : Mount Erebus) (HB) "Flower white; 24 inches (60 cm)" -- TG. Image Index: Tulip Gallery. Wilberforce, <1913 (HB) (RL) See under Breeder Tulips. Wildlust. See: Glacier under Darwin Tulips. William Copland Rose, 1918 See Rose Copland under Darwin Tulips. Winnetou, 1939 (HB) (RL) See under Breeder Tulips. Yellow Crown. See: Golden Crown. Yellow Emperor, <1914 (HB) "Cottage Tulip. Flower yellow. Type 1: cup-shaped, e.g., Bouton d;Or (Fig. 1).. Large, often minutely dotted with red; 22 inches; May 13, 15 days." -- Report, 1914-15 / Cottage Tulips. Yellow Perfection, <1913 (syn. : Empress of China) (HB) (RL) "Flower yellow, flushed olive; 22 inches (55 cm)" -- TG. Image Index: Tulip Gallery.